What if you learned that your fiancé was not who he claimed to be? Engaged to the charming and seductive Greg Anders, Sara Shaw is happily anticipating her wedding in Edilean, Virginia. The date has been set, the flowers ordered, even her heirloom dress is ready. But just three weeks before the wedding, Greg gets a telephone call during the night and leaves without explanation. Two days later, a man climbs up through a trapdoor in the floor of Sara’s apartment, claiming that he is the brother of her best friend and that he’s moving in. While Mike Newland is indeed telling the truth about his identity, his reason for being there reaches far deeper. He’s an undercover detective, and his assignment is to use Sara to track down a woman who is one of the most notorious criminals in the United States—and also happens to be the mother of the man Sara plans to marry. 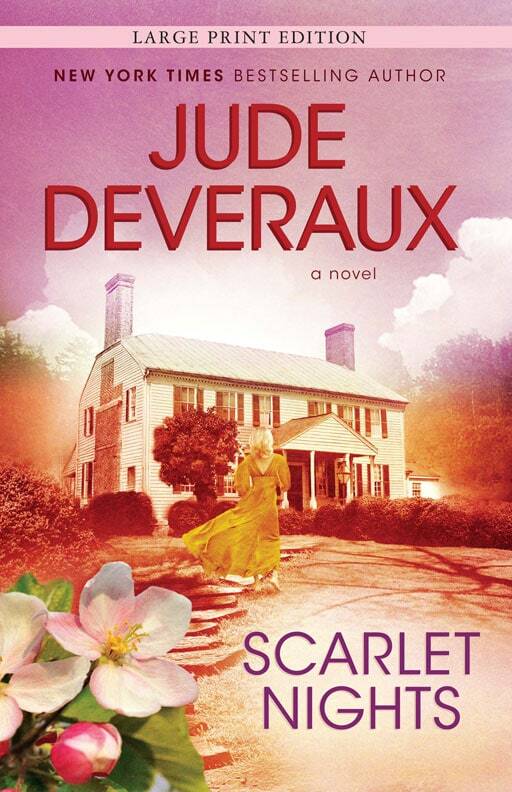 This reading group guide for Scarlet Nights includes an introduction, discussion questions, ideas for enhancing your book club, and a Q&A with author Jude Deveraux. The suggested questions are intended to help your reading group find new and interesting angles and topics for your discussion. We hope that these ideas will enrich your conversation and increase your enjoyment of the book. Sara Shaw is beautiful, good-hearted, a devoted churchgoer, and the best pie maker around. The catch: she’s engaged to a man everyone despises, a man who happens to lead a secret life of fraud and thievery and who is wanted by the FBI. When Mike Newland, an undercover cop assigned to catch Sara’s fiancé Greg and his convict mother, arrives in Sara’s small town of Edilean, Virginia, things begin to heat up. Mike must work to gain Sara’s trust to help him catch the infamous criminals—and in the process, he falls head over heels for Sara. Together Mike and Sara discover the secret of the town—and Mike’s family—that has been hidden for nearly seventy years. In the end, Mike finally learns what it means to have a family and Sara realizes what it means to be loved. 1. “Sometimes she felt torn between the man she loved and the town she adored” (22). Sara faces this dilemma early in the story as she is forced to choose between her quiet country life and family and the man with whom she has fallen in love and agreed to marry. Was there a singular event you see as the moment of Sara’s realization that the world is not an easy place—even in the seemingly perfect town of Edilean, Virginia? Why do you think she falls in love with Greg Anders? Why do you think it took an outsider—Mike—to open Sara’s eyes to the truth about Greg? 2. Discuss the significance of Merlin’s Farm. What does it represent for Sara? Arguably, the farm was both an escape and an entrapment—without the farm, Greg would not have wanted Sara. But the farm is also the setting where Sara and Mike first fall in love. Do you see the farm as more of an escape or an entrapment for Sara? How so? 3. What does the title Scarlet Nights symbolize? 4. Why do you think Mike keeps his personal life a secret from his coworkers and friends? Why does he find it so difficult to tell Sara the truth? Do you think he is ashamed of his past? 5. How do Ramsey and Tess factor into the story? Do you view them as minor characters or as necessary to the integrity of the story? How much or how little do you think Ramsey and Tess aided in Sara’s discovery of love, happiness, and survival? 6. How would you characterize Mr. Lang? What are his intentions? Consider his character from the points of view of Sara, Ellie, Mike, and the collective town. Who do you think knows the “real” Mr. Lang? How can you tell? 7. The novel opens in Fort Lauderdale, but most of the story takes place in Edilean. Discuss how the different settings help transform Mike and Sara. Would it have been possible for Mike to change if he hadn’t been to Edilean? Would Mike and Sara’s relationship have been different if she hadn’t gone to Fort Lauderdale against his wishes? 8. The struggle for intimacy and openness is a central theme in the novel. On page 3, Mike thinks, “Experience had taught him to reveal as little about himself as possible.” Think of other examples of the struggle for intimacy in the novel. Consider Sara, Mike, Tess, Mr. Lang, and Sara’s sisters in your response. How do each of these characters struggle with opening up to their family and friends? 9. What did you make of Mike’s initial good impression on the town of Edilean? Do you think initially his kindness was part of his act? If so, when did it become sincere? Why was everyone so willing to believe him? Why wasn’t Sara? 10. Discuss Sara and Ariel’s rivalry. What is the root of their dislike for one another? Are the two more similar or more different? Do you think they will ever be friends? 11. Revisit Mike and Sara’s picnic at Merlin’s Farm, beginning on page 109. Do you think Mike was showing his true feelings for Sara? Was this the moment they fell in love? How can you tell? 12. In Scarlet Nights, appearances are often very deceiving. Greg is really Stefan, Mrs. Myers is really Mitzi, and Mike is really in love with Sara. Think of other examples where things are not what they seem in the story. How does the author exploit this conceit? For what purpose do you think the author made use of this theme? 13. What was your reaction to the ending of the story? Would you call Sara the heroine? Do you think Mike and Sara will live happily ever after? 1. Edilean, Virginia, is a fictional town, but it represents an idea of small-town life that is part of our collective conscience. If you don’t already live in a small town, take a daytrip with your book club to one nearby. Visit restaurants, shops, and churches. Talk to the locals and sample the food for which the town is most proud. Over lunch, discuss with your book club the similarities and differences between this town and Edilean. Can you imagine high-profile criminals slipping unnoticed into town life? Why or why not? 2. Jude Deveraux is a popular bestselling author. If you haven’t done so already, have your book club read the previous two books in the Edilean family series, which began with Lavender Morning and continued with Days of Gold.Or, if your book club has already read these novels, discuss the characters that overlap. Do they change from one book to the next? Does Edilean change? Which book is the group’s favorite? 3. The characters in Scarlet Nights are deeply connected to their Scottish heritage. Recreate the festival with your book club. Host a party and have each member wear a medieval gown or kilt like the characters in the book. Serve lavender cookies, have a tarot card reader, and serve Scottish beverages. Have one member research the history of Scotland and present the group with a history lesson. Why do you think the town felt so closely connected to Scotland? You’ve written several other historical romance novels. Did any of your previous books inspire this story? Are there more books to come in the Edilean family series? In the past, I wrote a series about two families, but I found that limiting, so I decided to create a town. I came up with seven founding families, showed their personalities and interests in Days of Gold, then carried them forward. Yes, I plan to write lots more books set in Edilean. I truly and deeply love my characters. I want to write about other characters in the town besides those from the founding families. I want to see how they feel about living in a town that’s run by families that have lived there for centuries. Who is your favorite character in the story and why? Do you think this is Mike’s story more so than any other character’s? Why or why not? I think Mike’s life changed the most. He was a very lonely man, but he didn’t know it. His sister, Tess, did and she fought to give him a life, but Mike didn’t know what he was missing. But I also think Sara’s life changed. She was devastated by the loss of Brian, the man she loved. She had her entire life planned out, knew where she was going and with whom, then zap! it was all taken from her in an instant. It took away her sense of self. I think maybe she felt that all she deserved was a man like Greg. How did you come to be a writer? What is your background, and who are your influences? I write because I have stories running around in my head. I never dreamed of being a “writer” per se. I just wanted to put the stories in my mind onto paper. I haven’t changed. I still have characters in my thoughts, and I want to find out what happened to them. I want to hear them talk and see what they do if they are in a certain situation. Describe the journey you took while writing this book. How many hours of research did you have to do in order to capture the spirit of the Southern town? Is Edilean based on your hometown? Was there any character that you spent more time researching than the others? Edilean isn’t based on any particular small U.S. town but all of them. As for the research, I spent many, many hours on it. My good friend Detective Charlie Stack helped me with all of it. He directed me to books and websites and he answered all my questions, whether I asked about martial arts or economic crimes. I spent more of the time learning about the types of fraud that people like my fictional Mitzi committed than I did anything else. It was fascinating to me how women like her work. You have been praised by Romantic Times magazine as an author who “has always enchanted readers” and who “instinctively knows what every woman is searching for—her own knight in shining armor.” Was your goal to have Sara find her “knight in shining armor”? Do you think this is a correct assessment of what your books aim to do? I like for my people to find True Love—and that’s not always easy. I have started writing several books in which the hero and heroine disliked each other so much that I discarded the book. It’s okay if they think they hate one another but feel physical attraction, but if there’s nothing between them, then I can’t work with it. As for Sara, she deeply and truly needed someone to rescue her. I don’t think she realized—but the town did—that she was heading down into a deep depression, one that she probably wouldn’t have recovered from. Even if Greg Anders weren’t a criminal, the truth was that he didn’t need Sara. Mike did. Sara gave him a home and a future. They were perfect together. Why did you decide to tell the story from both Mike’s and Sara’s points of view? What effect do you think this has on the story overall? Sometimes I need for a character not to know what’s going on in the story, so I write in first person. In Scarlet Nightsthere was so much going on that I had to keep the reader informed of every change and every secret. When I was first plotting the book, I thought of telling the story just from Sara’s point of view. What Mike was doing and why would be kept a secret, but when I tried that, he came off as a jerk. He was sneaking into the apartment, then staying there even when Sara told him to leave. It didn’t work! I changed it all and told the reader everything upfront. Sara was the one who didn’t know what was going on, not the reader. Did any real-life criminals inspire the characters of Greg Anders and his mother? Yes, they did. In fact, everything I wrote about Mitzi and Greg is the truth, based on real cases. You have a remarkable talent for capturing the description of Southern life, especially the food and the landscape. Was it difficult to bring the South to life? Do you write more from experience or imagination? I just write about Edilean as I see the town and the people. Since I am Southern, I describe what I know. I have a passion for old houses, so it’s been fun to find houses that fit my people, then have them walk around inside. If I use an old house as the model, I like to imagine how the residents over the years would have remodeled it. I always have a thick stack of photos of the house, the facade, the floor plan, and the setting. Merlin’s Farm has been the most interesting because there’s so much to it. I have many pages of photos of that place, as it’s based on an actual plantation. Who is your favorite author? Who are you reading now? What is next for you? I don’t really have a favorite author. The truth is that I read very little fiction. I read a lot of nonfiction for my research. I have several TV shows that I watch, as I think it’s good for me to keep up with current slang and what’s going on in the world. I also watch a lot of movies and I have favorite DVDs that I play often. Want to receive Jude Deveraux’s newsletter in your inbox?